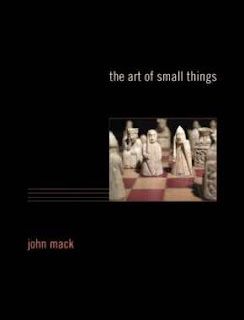 I've recently finished reading The Art of Small Things by John Mack, published by Harvard University Press, 2007. Mack explores our fascination with small, crafted items and offers a survey of their forms and functions in a variety of cultures spanning several millenia. "The making and manipulating of the miniature constitute not just the product of a technology of the aesthetic but also a cultural process... the starting point for narratives that can be of potentially epic proportions." Illustrated with items in the British Museum's collections, the book is written in a straightforward manner, clearly intended for general consumption. 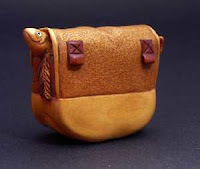 For those interested in netsuke, several pages are devoted to this art form. Interest in this aspect comes not from new light he sheds on these carvings, but their placement within a broader context of small objects made for personal adornment. I take the title of this post from an essay by Robert Gibbings, of the same name. It was published in Matrix, an annual letterpressed effort by the Whittington Press in England. Matrix offers essays, reminiscences, illustrations and samples of topics related to letterpress printing. Paper marbling, wood engraving, graphic design, and printing history are all represented in this hand-set work of art. Precision - wood calls for it: gentle, tractable material, exquisite to contemplate, whether alive in a forest, where every branch is a record of the winds that blow, or dead in a timber yard where the serpentine grain of the planks reveals a history of its growth. It may even tell the death of a neighbor, for where in a forest a tree has fallen there will be increased light and air, and where there is increase of light and air there will be increased development in the trees that remain. In Venezuela and certain regions of South Africa the growth of a box tree remains constant, slow and steady; a cross-section of its trunk shows the rings as regular and even as the plumelets on a feather. 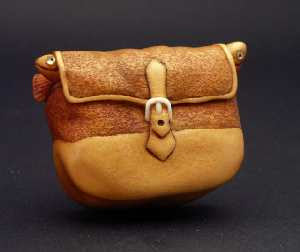 That is why boxwood from those countries gives to the engraver a close-fibred material that is as hard almost as metal. On the end of that grain the artist's burin incises lines in any direction that the guiding hand may desire; there is no let or hindrance from the grain." 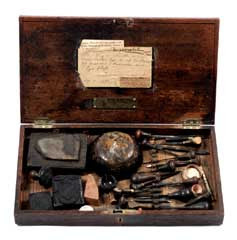 Incidentally- the illustrated toolbox, courtesy of Tyne and Wear Museums , is from none other than Thomas Bewick. More about him later. This recently finished carving was inspired by a wood engraving by Robert Gibbings in his book Coming Down the Wye . Chapter Three (pg 14) contains a short, humorous account of his meeting a poacher along this Welsh river. I've got an interest in wood engraved illustrations and Gibbings' work has become a favorite of mine lately. The carving measures 4cm across. It was scultped from boxwood, with the trouts' eyes inlaid with pearl shell, and a buckle of ivory. Strap loops on the back are inlaid in mopane, a southern African wood. It has been selectively stained using an acid oxidation technique. This piece along with others of mine will be for sale at Edgewood Orchard Gallery for their 2008 season. Edgewood Orchard is located in Door County, northern Wisconsin. This part of Wisconsin is perfect for a weekend trip- small villages showing touches of Scanda navian heritage, many galleries, cherry orchards, views of Lake Michigan and of course, delicious places to eat. If you enjoy fishing, you might even land your own bag of trout.